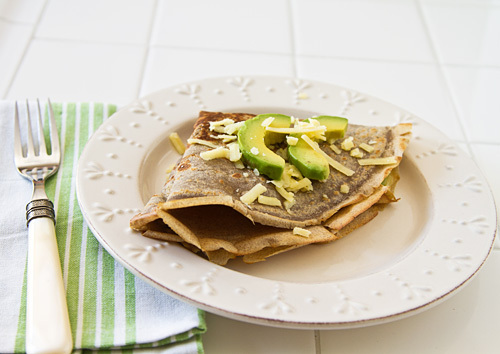 Buckwheat crêpes filled with aged cheddar cheese and creamy slices of ripe avocado make for easy comfort food that can be enjoyed any time of day. I’ve got a weakness for crêpes. My first memory of eating them was in the fourth grade when I spent the night at my friend Katie’s house and her mom made crêpes for breakfast. They had one of those electric crêpe makers with a circular surface that heats up that you then dip in batter and pull out so that it makes a perfectly even, thin crêpe. I remember wishing I could eat crêpes all day. Life since then has been filled with lots of crêpes. First in my high school French classes when we had food parties, when it was always a requirement that someone make and bring in crêpes, and then again in undergraduate school when my French classes would occasionally throw a food party. When I moved to Paris to study for a semester, I had a favorite crêpe vendor near school who would always make me a fresh crêpe, even if he already had a stack that he’d made ahead. I was always fascinated with how deftly he spread the batter across the large hot circular griddle without leaving any lines, as if the batter had spread into a perfectly even circle all by itself. I always got Nutella and bananas from that crêpe vendor. However, whenever I would go out to the Montmartre area of Paris, I would stop by a crêpe vendor near Sacre Coeur that made my favorite savory crêpe (galette, if we want to be correct), one filled with Gruyère cheese and thinly sliced smoked ham. The first time I moved to Japan, I discovered that the Japanese had a love for crêpes too—you don’t have to venture far in Tokyo to find a crêpe stand or restaurant—and so my crêpe saga continued. Although crêpes are delicious, I think my many memories that go along with crêpe indulging probably add to my fondness for them. Though whether or not you have your own crêpe memories, crêpes are fantastic comfort food. So when my friends at ManPans were looking for someone to feature their new 16-inch perforated pizza pan (which you’ll be hearing about soon), as well as an additional piece of cookware, I immediately thought of making a crêpe recipe using their 12-inch Fry Pan. Not only is it a fantastic frying pan, but it’s an equally fantastic crêpe pan. The size is perfect and the sloped sides of the pan make it easy to flip the crêpes. The pan is light, making it easy to tilt and spread the crêpe batter, and their signature handle ensures that you won’t burn your hand in the process. 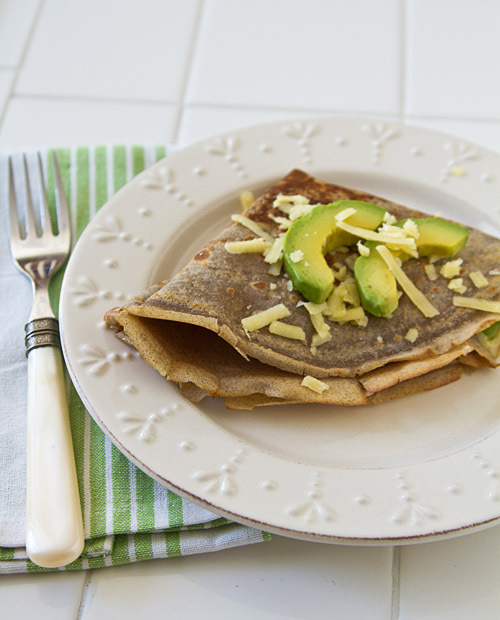 I love savory buckwheat crêpes, and they are especially good with aged cheddar cheese and avocado because the nuttiness of the buckwheat pairs nicely with the sharp tang of the cheese and the creamy sweetness of the avocado. Check out how easy they are to make in my video, and then scroll down for the recipe! 1. Make the buckwheat crêpe batter: Whisk the buckwheat flour and sea salt together in a large bowl. Add the eggs and mix (the mixture will be thick and uneven). Add the milk 1/3 cup at a time, until the batter is a liquid consistency. (*Alternatively: combine the flour, sea salt, eggs, and milk in a blender and pulse a few times until smooth.) Cover the batter and let it rest for 30 minutes in the refrigerator. 2. Make the buckwheat crêpes: Melt a small piece of butter in a 12-inch frying pan over medium-low heat. Spread the butter over the bottom of the pan evenly with a folded paper towel. 3. Add 1/4 cup of batter to the pan and swirl to cover the bottom of the pan with a thin layer of batter. Let the crêpe cook for 1 minute, or until it is slightly moist on top and golden underneath. Loosen the edges of the crêpe, slide a spatula under it, and then gently flip it upside down into the pan. Cook the otherside for 30 seconds, and then transfer to a plate. Repeat with the remaining batter, separating the crêpes with pieces of wax paper. 4. Fill the crêpes: Put one crêpe in the frying pan over medium heat. Let it rewarm for about 10 seconds, then flip it over. Sprinkle shredded cheddar cheese over half of the crêpe and let it melt slightly. Add sliced avocados, then fold the other side of the crêpe over the filling, and then fold it into quarters, remove from the pan and serve immediately. Repeat with the other crêpes. 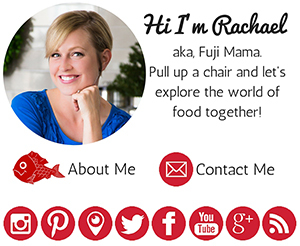 *Disclosure: ManPans sent me the 12″ Fry Pan to feature for this post. You come up with some of the most creative ideas for avocados! You know probably the best crepe I’ve ever had, and what began my love of crepes, was in that little place in Omotesando that I went to with you! Alas, now I know I’m coeliac, crepes are few and far between, so yay! to this gluten free one! Thanks! I love buckwheat! 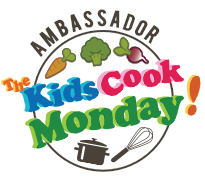 I use it in pancakes, porridge, flatbread and even mixed with polenta. One thing I’ve found, is that in baking or cooking over a stovetop, is to always add a bit of yeast a few hours before, to lighten the fare. 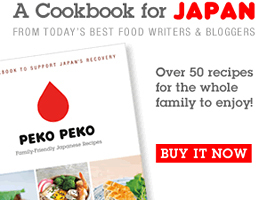 It has a mitigating effect on the “brick effect” that buckwheat is noted for in its cooked form. Thanks for the crepes recipe Iafm, I’ll give’er a whirl! I have made this crepe countless times since I read this post. I added some caramelized shallots and I must say I agree with the above commentator who said it was the best crepe she’d ever had! These look so delicious. What a creative crepe filling. I am going to try it. Thank you for the wonderful recipe.